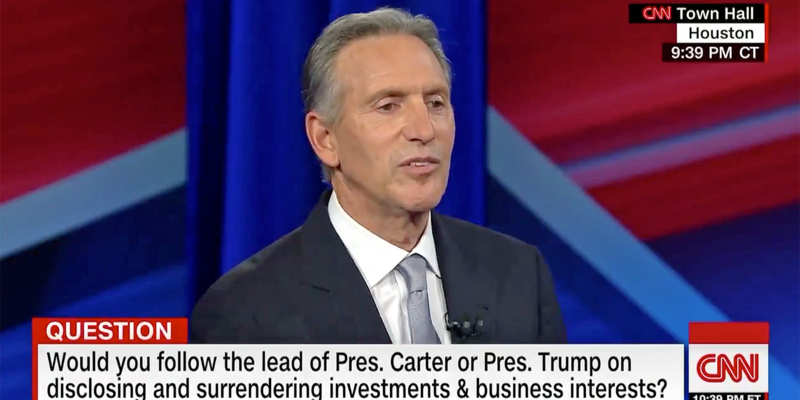 „I think we’re getting way premature,“ Schultz said when CNN reporter Poppy Harlow asked the question and highlighted his $2 billion stake in Starbucks. „I will do nothing whatsoever to have any conflict of interest between my investments overall, or my interest in the company that I love,“ Schultz said of his possible candidacy. Schultz is Starbucks‘ largest shareholder. The question arose out of a broader discussion on potential conflicts of interest Schultz may face as a potential candidate, after having served as chief executive of the world’s biggest retail coffee chain. Schultz was in charge at Starbucks in 2017 when the company bought out the outstanding shares in its Chinese joint venture for $1.3 billion, which allowed the company to scoop up 1,300 stores in Shanghai and elsewhere in the country. Schultz has said that China is on track to become Starbucks‘ biggest market. Schultz is Starbucks‘ largest shareholder with 3% of the company’s shares in his coffers. The question about arose out of a broader discussion on potential conflicts of interest Schultz may face as a potential candidate — and as president, if he were elected — after having served as chairman and CEO of the world’s biggest retail coffee chain for a cumulative 23 years, between 1986 and 2017.